Crown-of-thorns starfish (Acanthaster planci) have wreaked havoc with many reefs in the past by their voracious appetite for hard coral. These days their numbers are smaller and they cause no major problem. The thorns however can cause permanent nerve damage if touched, so be careful. From South Reef. 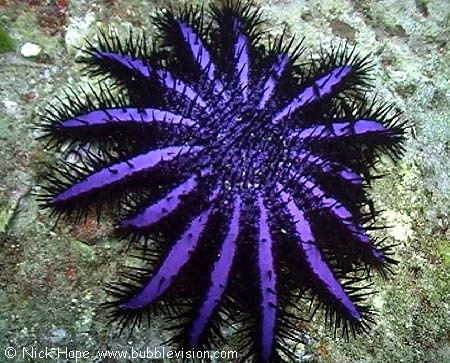 Crown-of-thorns starfish feature in my DVD.